The parentage of Thomas Fettiplace is far from certain, though it seems likely that he was a son of Henry Fettiplace Esquire of North Denchworth (Berkshire). He was certainly a fourth son, as shown by the martlet which was sometimes displayed on his coat of arms, and he is known to have had a brother, 'John of Woolley' Park (Berkshire), which was probably a secondary (rented) manor to Denchworth. With no prospect of any significant inheritance, Thomas decided to make his living in the world of manorial management and, in 1413, was appointed steward to Gilbert, Lord Talbot at the manor of Bampton in Oxfordshire. Talbot's main estates were in the Welsh Marches, but he and his family may have stayed at Bampton while attending the King at Oxford or Woodstock. Thomas certainly seems to have got to know them well for, after Lord Talbot was killed at the siege of Rouen in 1418, he married his widow, Beatrice. This event, which almost certainly took place in 1422, infers that Thomas was a man of a bold and resolute temperament and well-favoured in person. It has certainly invested the Fettiplace family "with an atmosphere of romance which time has not dissipated" and added immensely to their importance and wealth, for Beatrice was not only Lady Talbot, but a minor member of the Portuguese Royal family. Her exact lineage is not known, but her arms suggest she may have been a member of the De Sousa family, descendants of an illegitimate son of King Alfonso III. She had apparently been in the employ of Queen Katherine where her "good service" was recognised by King Henry V who considered her "his true liege born within this realm" (despite the fact that she was actually born in Portugal). Thomas held many high offices and positions of responsibility in Berkshire and elsewhere. In 1432, he was elected MP for Oxfordshire and, three years later, was appointed Sheriff of both Oxfordshire and Berkshire. In 1436, he was also given the job, jointly with his probable nephew, Peter Fettiplace of North Denchworth, as Commissioner of Array for Berkshire. He last appears in official documents in 1442, when he was issued a commission (with others) "to treat with spiritual and secular persons in the said County [of Berkshire] for a loan to the King in his present necessity, and to bring the same to the receipt of the Exchequer ". He seems to have died soon afterwards, probably in his late forties. Despite his high position and courtly connections, Thomas was never knighted. Thomas owned land in Childrey and even houses in Caen (Normandy) as well as almost certainly being Lord of the Manor of East Shefford, residing at East Shefford House, otherwise known as Hugditch Court. His lands may have largely come from his wife's generous dower, confirmed to her by her brother-in-law, the Earl of Shrewsbury. This would have included the manors of Stokenchurch (Oxfordshire), Maidencourt (Berkshire) and East Shefford (Berkshire) inherited by his three sons, William James and John, respectively. 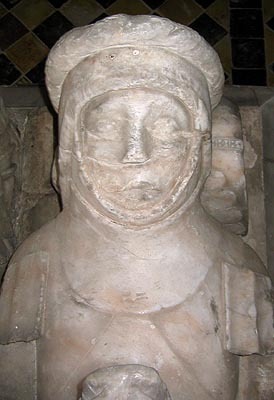 Thomas' widow, Beatrice, Lady Talbot, died on Christmas Day 1447 and she was buried alongside her second husband under a beautiful alabaster tomb in the little old redundant parish church at East Shefford. It would have been commissioned by their wealthy merchant son, John, and its details show it to have come from the workshops of Thomas Prentys and Robert Sutton in Chellaston (Derbyshire), the school from whence so many of the richest and most celebrated examples of sculptured tombs in this beautiful material emanated at the later end of the 14th and first part of the 15th centuries. � Nash Ford Publishing 2005. All Rights Reserved.